Pronorm Proline 128 is the ultimate contemporary kitchen range. Designed around a typical German grid system, cabinet sizes increase in increments of 128mm. This enables us to create versatile designs, whilst maintaining clean lines and a minimalist aesthetic. This range is available in a wide variety of door finishes. These include gloss and matt laminates, multiple lacquered options, glass, wood veneer, metallic and ceramic. This variety of finishes, in an array of natural colours and price points, means that Proline 128 offers a solution for any kitchen buyer in search of something truly contemporary. Proline 128 is the ultimate designer kitchen. Pronorm have created a range of furniture that offers form and flexibility. Beautiful door finishes coupled with cabinets of all sizes means there will always be a design solution to suit your home. Proline 128 offers the latest Industrial styling that will give your kitchen that eternally functional look. From metals to stone effect, these doors won't disappoint. Cabinet measurements and proportions are an essential part of a well designed kitchen. Pronorm's 128mm grid system refers to the incremental heights of the cabinets and front panels. The doors, drawer fronts and pull outs all align with beautiful symmetry. This enables the designer to create a perfectly balanced elevation of furniture and appliances. Not only is this important from a visual perspective, it allows for a kitchen to be ergonomically tailored to suit your needs. Proline 128 comes in a wide range of natural colours and amazing finishes. You have the option to stick with one style or mix and match with another. Whether you want your kitchen to stand out or blend in, Pronorm offers the solution you're looking for. 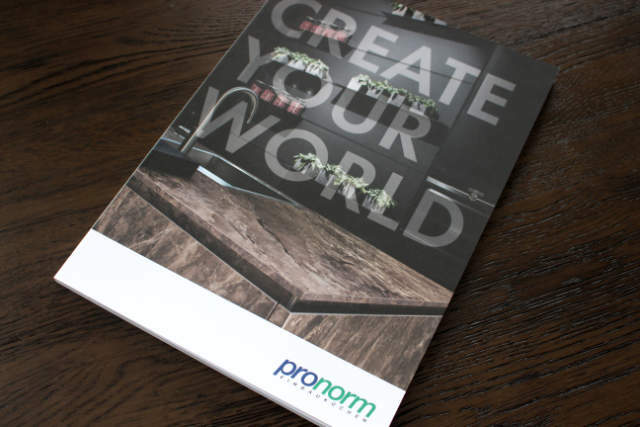 The fabulous Pronorm kitchens brochure is available for instant download. Get your copy today and be inspired.